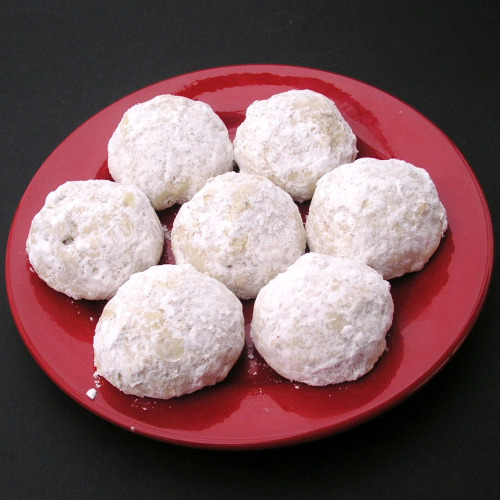 When I started baking Christmas cookies the recipe for Russian Teacakes came from a Betty Crocker cookbook which had been given to me as a gift from our dear friends Lenny and Terry who were our neighbors when we lived in Washington, DC. I still have the book in my collection (which now numbers over 1500 books!). It's a bit tattered and stained, but reading it brings back so many wonderful memories. I always start my holiday cookie baking with these cookies. You may use any nut you like, walnuts, almonds, hazelnuts (my favorite) or pecans. 2. Sift together and stir in the flour and salt. 3. Mix in the chopped nuts. Chill. 4. Roll into 1" balls and place on ungreased baking sheet (cookies do not spread). 5. Bake at 400° 10 to 12 minutes, until set but not brown. 6. While still warm, roll in confectioners' sugar. Cool. Roll in sugar again. May I invite you to become a subscriber? Just enter your e-address in the box on the upper right. You'll receive an e-mail alert when I post a new article. Absolutely no spam! Thank you.